Football is in an age where the ‘agricultural’ variety of defender is looked down upon. The role is possibly one of the most demanding in the business today, with passing technique and vision holding the same importance as the actual tackling and interception side of defending. Interestingly, the youth products emerging across Europe seem to be keeping pace with what’s expected of them, allowing their managers to devise more adventurous football than ever before. Our rankings are an attempt to track the finest young exponents of a rapidly evolving art form. Kicking off this list is Valencia’s Jose Gaya. The young left back has been long admired by Talent Radar, and this season, Valencia’s run of strong form has seen him get some time in the spotlight. His energetic running has been a feature of a strong counter attacking unit forged by Marcellino at the Mestalla, and scouts from across Europe will train a closer eye on Gaya now. Staying in Spain, number 9 this time is Pablo Maffeo. The right back has been a constant part of Girona’s backline this season. The highlight of 2017-18 so far for him would have to be his thrilling performance in the win over Real Madrid, where he picked up an assist. Dropping 4 places down the list is Leipzig’s Dayot Upamecano. The Frenchman has been a beneficiary of Leipzig’s youth oriented policy, and has seized his opportunity this season. Leipzig have made a steady recovery after a slow start to the season, but Upamecano’s personal performances have plateaued a little. His performance in the 2-0 loss to Bayern was particularly damning, and consequently, he drops down the list. Another young French defender suffering the same fate is Dan Axel Zagadou. After a promising start to the season, both Zagadou and Dortmund seem to be affected by gravity at the moment. Bosz will do well to arrest the slide, and might just look to improved performances from key players to aid that particular mission. At rank 6 is Andreas Christensen. It is a bit jarring to see a Chelsea player in these rankings, but Christensen has truly earned his spot. He recently became the first Chelsea academy graduate since John Terry to start 3 games in a row, which is a big breakthrough. Moreover, he seems to have Conte’s trust in the sweeper role over Luiz, which is a big win for the Dane considering Luiz won the title from there. At the base of the top half of this table is Benjamin Pavard. The young man has most often started at centre back this season, but his skills on the ball have prompted Hannes Wolf to try him out in midfield as well. His best performances though, have come at centre back. He’s been in the starting eleven all through, helping Stuttgart to a mid-table position so far. Ajax had the difficult task this summer of trying to replace Davinson Sanchez. They eventually opted for Maximilian Wöber, and the young Austrian seems to have settled in well now. Ajax took some time to get their campaign off the ground, but seem to have built some momentum now. That this phase has coincided with a run of starts for Wober bodes well for the youngster, and Ajax in general. Onto the podium now, and the first name here is that of Thilo Kehrer. The German has been near constant in Schalke’s backline this season. He’s imposed his all action style well in a league where such qualities aren’t in short supply. Schalke are only 5 points off top spot, and will be looking forward with confidence after their recent 4-4 draw against their arch rivals Dortmund. The top 2 have swapped placed from last time, with Clement Lenglet dropping down to the silver medal spot. He’s been a key spoke in the wheel for Sevilla, who are just 2 points behind Real Madrid, and close to securing Champions League qualification. Lenglet is part of a steadily growing French contingent in Andalusia, and his calm defending has been called upon several times this campaign. Top of the pile is Jorge. Burdened with the onerous responsibility of replacing Benjamin Mendy, Jorge has shone under pressure. 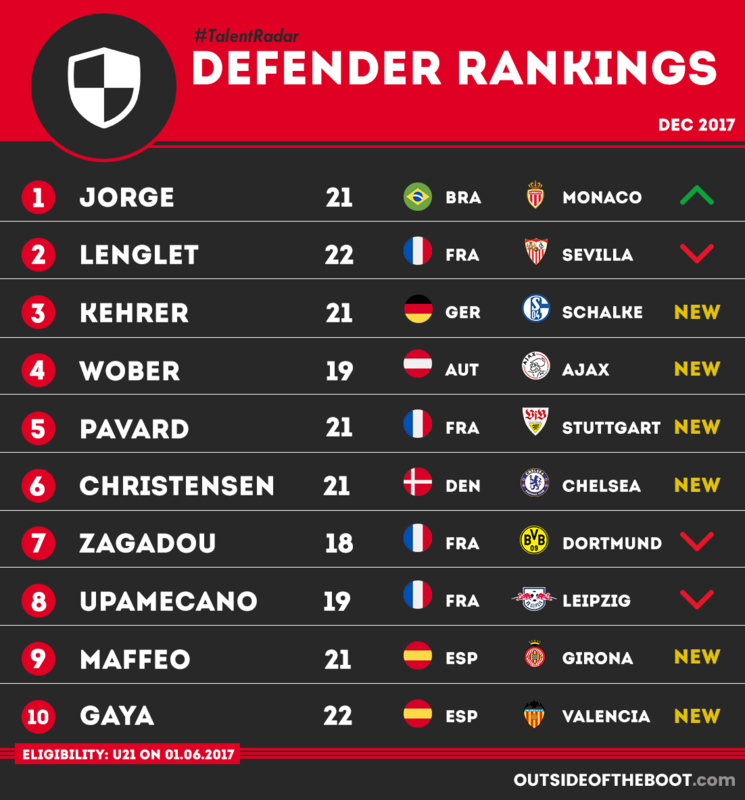 Sadly, Monaco haven’t been able to keep up with their exploits from last season, but they still have some good young players who could spark another revival soon, and Jorge is one such player. 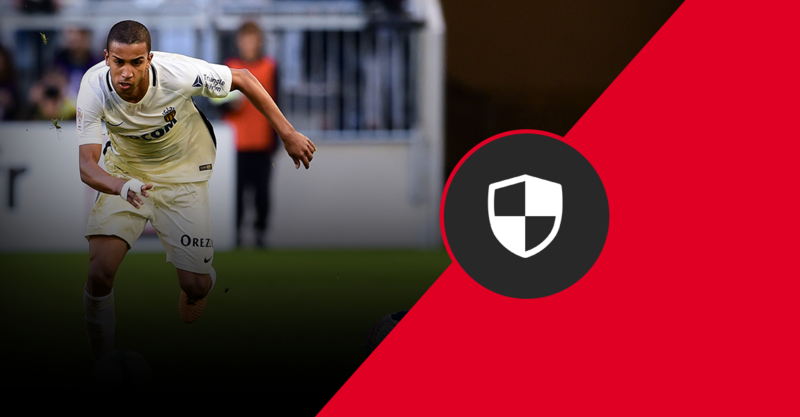 The Brazilian has been a marauding presence down the left flank, and will hopefully continue in this vein.